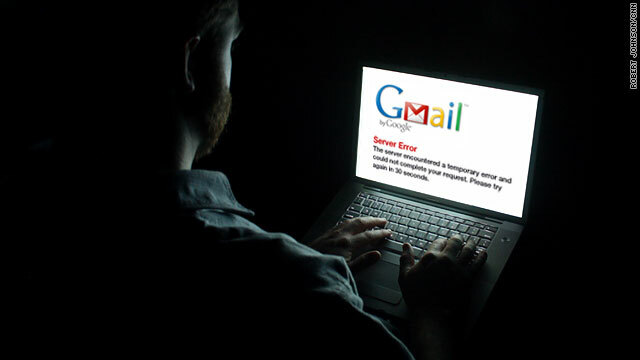 Gmail outages in 2009 showed how many people and businesses depend on Google's free e-mail service. (CNN) -- It was a big year for technology: Twitter and Facebook's popularity exploded, while new smartphones, e-readers and a host of other gadgets cropped up to compete for our plugged-in affection. But into each electronic life a little digital rain must fall. We polled a handful of the most tech-savvy folks we know for their thoughts on the worst moments in technology from 2009 -- the most epic "fails" of the year. Technically it was a New Year's Eve surprise. But many owners of Microsoft's Zune media player started 2009 with little more than a paperweight with LED lights. At midnight on December 31, all Zune's 30-GB MP3 players froze up. Microsoft explained the problem as a problem with the way the device's internal clock recognized (or didn't recognize) leap years. The glitch only lasted a day, but didn't help a device that was already failing to gain ground on Apple's iPod. The reaction of many in the tech community to the release of the TwitterPeek device was a collective, "Huh?" Sure, there are some people who don't have smartphones and don't want to pay for expensive mobile plans. But is there really a market for a $199 device that does nothing but let you manage yourTwitter feed? "I already have a $200 device to update Twitter," said one techie we spoke to. "It's called my iPhone." The folks at Peek, makers of TwitterPeek, had already made the Pronto -- a device that handled only texts and e-mails. Maybe a combination of the two gadgets is in the works. But even then, would enough people be interested? Probably not. OK ... so every time Facebook makes even the most minute changes, it sparks an outcry among its 350 million members, not to mention (irony alert) dozens of new Facebook groups geared at making the site change back. But a terms-of-service change in February went further, implying that Facebook owned the rights to anything users uploaded to the site. Another change suggested that Facebook held those rights forever, even if people quit the site or took the material down. Facebook responded that it simply needed those rights to be able to post information to other users. But when the backlash continued, the site eventually switched the terms back to their former wording. In what one observer called "an almost incomprehensible data disaster," T-Mobile told users in October that a server error at a Microsoft subsidiary had lost users' personal data it had stored for the devices. Phone numbers, contact lists, calendars and other information was gone -- and even new data would disappear if users turned off or recharged the phone. Users were offered free service and rebates in the wake of the mess, as T-Mobile scrambled to recover what little of the data it could. But that didn't stop the lawsuits, Internet griping and ill will generated by the snafu. It started as a story about someone hacking the accounts of several Twitter employees. Then, after Twitter said the attack was limited to personal information, not sensitive, company-related stuff, the hacker behind the attack struck again -- in a different way. He sent 310 documents to leading technology blog TechCrunch. The blog published a small portion of them and sent the documents to Twitter, which is when the company learned that they included financial projections and notes from high-level executive meetings. Twitter responded by reportedly closing the security holes that allowed the attack. Enough with the updates, already! This was the year that online social media exploded. That's good news for the future of Facebook, Twitter and the like. But sometimes it just got to be a bit too much. Members of Congress abandoned any pretense of paying attention to President Obama's State of the Union speech by updating their Twitter feeds as he was speaking. There was the groom who updated his Facebook relationship status at the altar. And the women who tweeted during childbirth. [In fairness, the most high-profile tweeting new mom was Sara Williams, wife of Twitter CEO Evan Williams]. And that's not even mentioning all those friend requests you got from your grade-school teachers and members of your mom's knitting circle. This is a failure we're glad to report. The Conficker worm was, by all accounts, a serious bit of malware that infected as many as 10 million computers worldwide. Instead of attacking those computers, it was designed to control them, paving the way for later attacks. When researchers spotted the date April 1 in the worm's coding, speculation began mounting that a major April Fools' Day attack was on its way. Instead, it was mostly quiet -- a false alarm of Y2K proportions. "I think the joke's on us a little bit, which you would have expected, having an April 1 date," Holly Stewart, threat response manager for IBM's X-Force, a computer security service, said at the time. On August 6, the concept of computer addiction didn't seem so silly. A massive denial-of-service attack hit Twitter, Facebook and the LiveJournal blogging site. Twitter was by far the hardest hit, completely blacking out for several hours. The attacks were believed to have targeted a blogger in the country of Georgia who had been critical of Russia. The attacks, the blogger said, coincided with the one-year anniversary of renewed violence between the two countries. What was telling was how freaked out people became. Users described feeling naked, jittery and upset without the ability to post on Twitter. When the site came back up, the top topic of conversation was the hashtag for "When Twitter Was Down." We heard some different views on this year's string of outages or slowdowns of Google's popular e-mail system. Some thought coverage was overblown. But as more computing power moves "into the cloud," people and businesses are relying on programs like Gmail not just for e-mails, but to archive documents, chat with friends or co-workers and store contact information. Gmail went through several high-profile crashes in 2009, including one in February and two in September. While e-mail crashes are nothing new to any provider, 2009's were the first since Google begain offering offline support. I got Google Wave -- now what? OK, so it's a little early in the game to call this one a total fail. But after the breathless anticipation that greeted Google Wave and the hot rush to get an invitation for its beta testing, lots of users found themselves asking, "OK ... now what?" Google, for its part, released an 80-minute tutorial video -- leading some observers to argue that if you need an hour and 20 minutes to explain what your product does, you might be in trouble. It's designed as a platform to allow users to communicate and collaborate in real time -- a tool some predict will be used effectively by developers in the future. But for now, it's inspired the creation of a Web site -- Easier to Understand Than Wave -- on which users compare the online tool to other sometimes obtuse subjects (Both Ozzy Osbourne and the geopolitical climate of Southeast Asia are easier to understand than Wave, users voted, while Sarah Palin and Scientology are both more difficult).